Happy Easter everyone! We hope you are enjoying the day and spending time with family and friends. 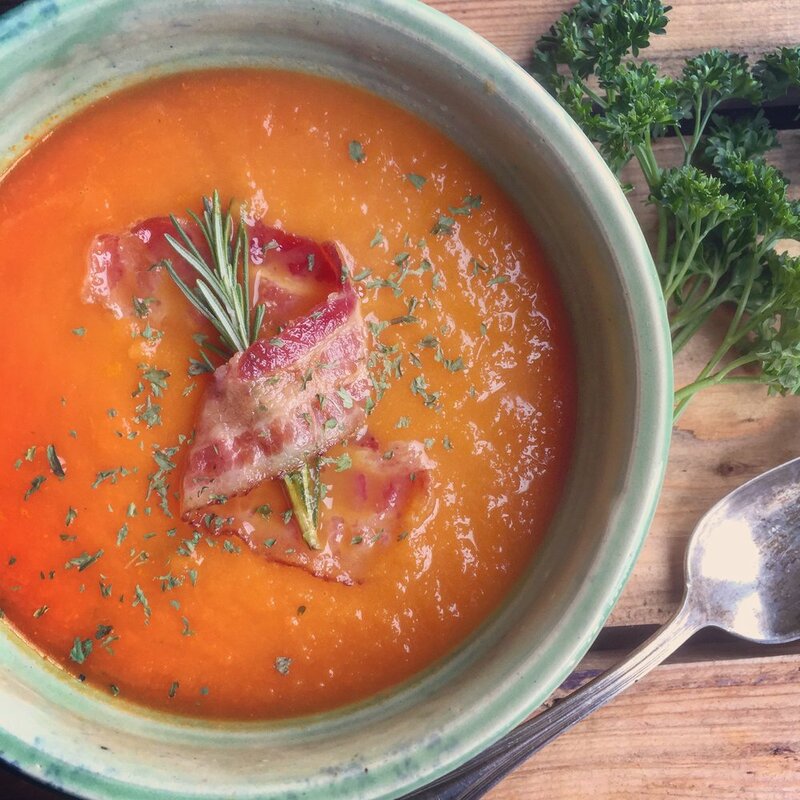 If you are entertaining this weekend, here’s a simple creamy Carrot Soup recipe to round out your perfect Easter meal. So yummy, we think it’s better than chocolate! Place oil in large pot over medium heat. Add carrots, onions, garlic, thyme and rosemary. Cook for 15 minutes, until carrots are fork tender. Remove herb sprigs and transfer carrots and vegetables to blender. Add bone broth and to puree till smooth. Transfer to large saucepan over medium heat and add bacon strips. Season with salt, pepper and hot sauce. Simmer until ready to serve. 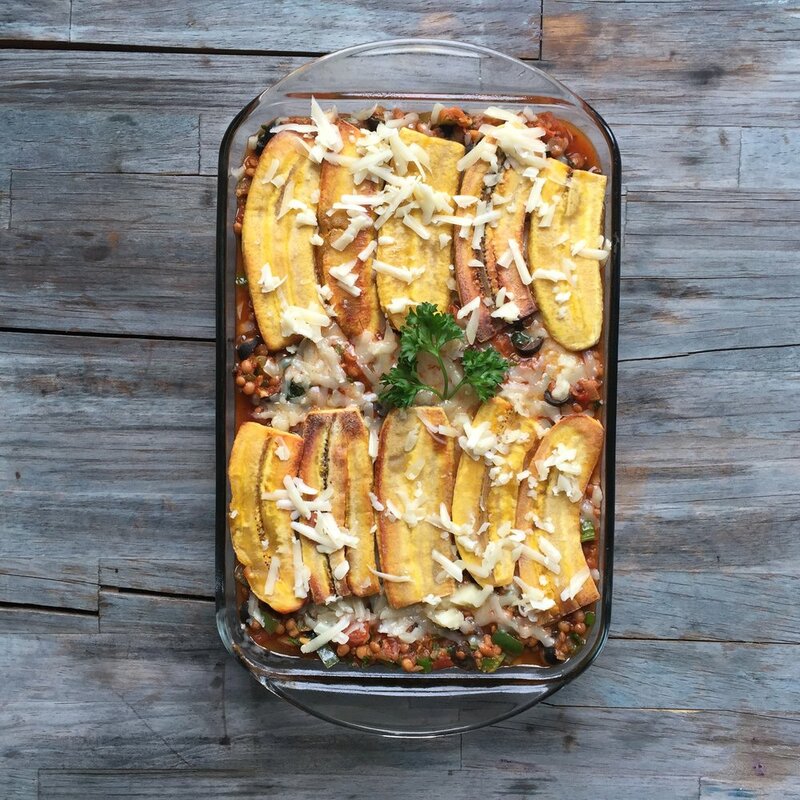 It's bone broth Jamaican-style, with this ‘jerk’ plantain lasagna. It’s gluten-free, nutritious and delicious! 1. Peel plantains and slice length-wise. Fry or bake the plantains. Set aside. 2. Add 1-2 tbsp of coconut oil in a skillet followed by onions, garlic, Jerk seasoning, paprika, thyme, sweat for about a minute. Then add spinach and tomatoes, bring to a simmer, add ground meat and cook for about 7-10 minutes stirring frequently, add bone broth. Finally add olives, green onions, parsley, adjust to taste. Remove and set aside. 3. Grease a lasagna pan. Line the bottom of the pan with the cooked plantain. Add the beef mixture, just like you would prepare lasagna. Alternate until both are used up. (cheese optional) Bake at 350 for 25-30 minutes. Let it cool then serve warm. Are you trying to go grain free or Paleo, but miss eating rice? Have you ever tried cauliflower rice? Cauliflower is such a versatile vegetable and one of my favourite things to do with it, is to turn it into “rice.” It’s nice to substitute a vegetable where a starch would usually be. In addition, it’s a great way to squeeze bone broth into your day. Wash and thoroughly dry a large head of cauliflower, then remove all greens and cut into 4 even sections. With a box grater, use the medium-sized holes or a food processor with the grater attachment, to grate the cauliflower into the size of rice, leaving any large, tough stems behind. Transfer to a clean towel or paper towel and press to remove any excess moisture, which can make your dish soggy. Once you have your cauliflower rice, it's easy to cook! Simply sauté in a large skillet over medium heat in 1 Tbsp oil. Add ¼ cup Bone Brewhouse Traditional bone broth and cover with a lid so the cauliflower steams and becomes more tender. Cook for a total of 5-8 minutes. Looking for a quick meal? Here’s a wonderful Ravioli and Spinach soup that’s quick to make. It’s super healthy and delicious too! In a saucepan, heat the Bone Brewhouse bone broth and bring to a boil. Add ravioli and cook, uncovered, for 7-10 minutes or until tender. Add spinach and chicken during the last 3 minutes of cooking. Optional: Serve with cheese. If you are seriously into bone broth then trying a broth-tail is your next step (if you haven’t already). Once you try bone broth in a cocktail, you might find that it mellows the alcohol out and for some, makes it easier and more enjoyable to drink. So, if you’re interested — or at the very least, curious – start with this Bone Broth Vodka Caesar. Here’s the recipe. Heat bone broth in a small pot just until room temperature and no longer gelled. Combine all ingredients in a blender until well combined. Serve with a celery stalk, piece of beef jerky, or pickled vegetables. In celebration of St. Patrick’s Day, a traditional Irish potato soup recipe made with Bone Brewhouse Traditional bone broth. Good health, good life, good bone broth! Here’s the recipe. Peel and dice the onion and potatoes. Melt the butter in a large saucepan. Add the onion and cook for one minute coating completely in butter. Add the potatoes and toss well with the onion and melted butter. Cover the saucepan and sweat the vegetables for 10 minutes, shaking the pot every few minutes to prevent sticking. Pour in the bone broth and simmer the soup for 20 minutes until the potatoes are tender. Turn off the heat and allow to cool, Purée the soup using a hand held blender or in batches in a blender. Add the cream and mix well together. Season with salt and pepper to taste. And serve with green beer!! Happy National Pi Day! The day math geeks around the world unite to celebrate 3.14 or math... and the rest of us celebrate with ‘pie’ (Get it?) And, who says you can only celebrate Pi Day with fruit pies?! Here’s a chicken pot pie that any Pi fan will love, after all it’s round, made with bone broth and infinitely delicious! For the crust, I used Pillsbury refrigerated pie crusts. Heat oven to 425°F. Line your pie dish. In a large saucepan, melt butter over medium heat. Add onion; cook 2 minutes, stirring frequently, until tender. Stir in flour, salt and pepper until well blended. Gradually stir in broth and milk, cooking and stirring until bubbly and thickened. Stir in chicken and mixed vegetables. Remove from heat. Spoon chicken mixture into your crust-lined dish. Top with second crust; seal edge and flute. Cut slits in several places in top crust. Bake 30 to 40 minutes or until crust is golden brown. During last 15 to 20 minutes of baking, cover crust edge with strips of foil to prevent excessive browning. Let stand 5 minutes before serving. Enjoy! One of my weekend favourites, a slow cooker pepper beef stew. The base of this stew starts with browned stewing beef, onions, layers of peppers, tomatoes and bone broth flavours simmered gently. Serve over creamy mashed potatoes, rice or couscous. Such a delicious, simple dinner option to warm the belly. When spaghetti and meatballs meet bone broth tomato soup...it's the best! Add turmeric and cherry tomatoes, and cook until the tomatoes softens and leave their juices. Add the tomato can, bone broth, apple cider vinegar and basil, bring to boil, cover with a lid and let simmer for five minutes. Transfer into the blender and pulse to obtain a creamy liquid. Season with salt and pepper and serve with spaghetti and meatballs. Yay! Sip, sip, hooray! My gut is feeling the love with this bone broth Avocado Latte. Not only is it delicious but it can heal and seal your gut too. According to Jill Grunewald, a holistic nutrition coach and founder of Healthful Elements, a cup a day works miracles for leaky gut syndrome but it's also good for maintaining healthy guts too. The gelatin in the bone broth helps to coat your insides, eases chronic intestinal conditions and even some food intolerances. A perfect addition to any Valentine’s Day celebration, simply heat any Bone Brewhouse bone broth and transfer to a blender. Add 3 tablespoons coconut oil, a dash of salt, onion powder, garlic powder and 1 medium Hass avocado (about 3/4 cup mashed avocado). Blend and serve warm... with roses 🌹🌹🌹. Enjoy and Happy Valentines Day! It’s Game Day and we have our Sunday game plan ready with this Super Bowl Turkey Chili. It’s easy to prepare, flavourful and healthy. It's full of beans, sweet potatoes, turkey and bone broth. Enjoy! Swirl olive oil in a dutch oven and brown turkey until cooked, remove from heat and set aside. Brown onions and garlic in another tsp of olive oil until done. Add turkey back to pot with onions and add spices. Stir and cook for one minute. Add tomatoes and juices, Bone Brewhouse traditional stock, beans and sweet potatoes. Bring to a simmer and cook for about 10 minutes or until potatoes are softened. Salt and pepper to taste. Top with cheese and serve hot. There are numerous claims that bone broth helps with digestive issues, improves memory, strengthens your immune system, promotes stronger bones and reduces joint pain. Many may claim there's still no definitive research as to the merits to these feel-good perks, but hey, doing a little more home cooking and a little less processed-food buying never hurt anyone. Not up for downing a bone broth latte? Then try this bone broth-based roast recipe that incorporates our Bone Brewhouse broth—and taste great too. Rub roast all over with olive oil. Chop leaves of rosemary and combine with garlic, sea salt and pepper. Rub around the outside of the roast to form a crust. Preheat a skillet or multi-cooker to 400 degrees. Add roast and sear on each side until lightly browned (4-6 minutes). Deglaze pan with bone broth and transfer all contents to slow cooker adding mushrooms and onions. Cover and cook on low for 8-9 hours. Remove and let rest for 15-30 minutes then slice to serve. Enjoy! Looks like it’s shaping up to be a yummy weekend… with this baked spaghetti squash and tomato curry. Sooo good and so easy to make. Here’s the recipe. Slice a spaghetti squash length-wise, brush with olive oil, salt/pepper and roast it in the oven face down for about 30-45 minutes on 375F. While that is roasting, fry in a pot one whole onion diced, one head of garlic crushed and ground beef in a pan. Then add 1 cup of Bone Brewhouse Traditional bone broth, 6 to 8 tomatoes diced, one whole green pepper diced and mushrooms chopped. Season with Italian seasoning and one tbsp. curry. Let simmer till the sauce thickens. Take your roasted spaghetti squash and remove the seeds. The skin hardens to a shell and the squash should be soft and look like spaghetti when you pull it away. Top with your curry sauce and enjoy! Happy New Year everyone! This is my new go-to-bone-broth-breakfast in a mug. What if I told you that you can transform bone broth into a delicious, creamy, frothy latte. Simply simmer 2 cups of kale with Bone Brewhouse Traditional broth. Remove from heat, add 2 tablespoons of coconut oil or butter or ghee and blend in a blender till smooth and frothy. You must try it, it’s a kale of a good time! Place all the ingredients in a medium size saucepan and whisk them together thoroughly. Heat over medium heat for 3-5 minutes, stirring occasionally to avoid sputtering. Reduce the heat to low and cover, allowing the sauce to simmer for 5 minutes longer. Turn off the heat and keep the lid on the pot to maintain its heat and steeping, while you prepare your noodles or other accompaniments. That’s it! Ready to serve.